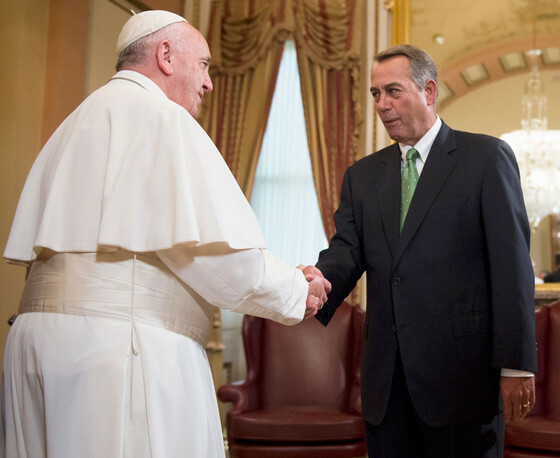 Was John Boehner's conscience pricked by Pope Francis' words "common good" and "common needs"? Also, his role as leader of an unruly House was exposed for what it is: nearly, but not quite, useless. I think it's possible that the pope's visit inspired Boehner to announce his retirement at this moment, rather than at some time in not-so-distant future. Also, he may have had enough of trying to reign in far right extremists who care nothing about doing their jobs of actually governing the country. Besides, he'll no doubt move on to a better paying lobbying job that is far less stressful. Whoever replaces Boehner as speaker will have to deal with the same Democratic president and the same filibuster rule in the Senate in attempts to pass legislation. 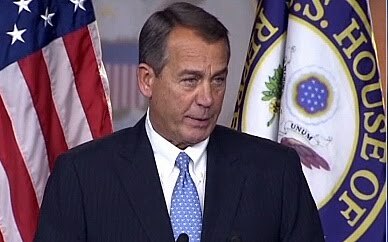 Though I am no admirer of Boehner, to his credit, he kept the barbarians behind the gate to avert several disasters. Since Boehner's position as speaker is no longer at risk, the likelihood of a government shutdown may be lessened. Another dastardly Republican plot is afoot to convince young people not to sign on to the Affordable Care Act but rather to pay the penalty. Sen. Angus King (I-ME) speaks strong words about the people in the groups participating in the scheme. Tuesday begins a 6-month race to enroll as many uninsured people as possible in the Affordable Care Act’s insurance exchanges. For the markets to be effective, they need millions of customers, and for elderly participants not to vastly outnumber younger ones. Their efforts have attracted the attention of one senator who recounts how being insured saved his life when he was a young adult, and who has since then watched others die due to lack of coverage. And he doesn’t mince words with those who’d take risks with other people’s health security. Sen. King is my hero for his plain-speaking in naming for what it is the despicable deception in the pressure groups' attempts to convince young adults they do not need health insurance. The extreme right in the US care about nothing and no one in their determination to achieve their own political agenda whatever the cost to people other than themselves. Even as those of us here at home watch in horror the spectacle of Republicans in their recklessness and intransigence risk the welfare of the entire country in their refusal to vote on the clean budget bill from the Senate, my friends from other countries watch with dismay and incredulity the continuing temper tantrum of the extremists Republicans in the House. It can't be reiterated often enough: If John Boehner puts a temporary spending bill on the House floor, without any anti-Obamacare stunts in it, it would pass. He can do it today and avoid a shutdown, or he can do it in a few days or weeks and end a shutdown. It's up to him. Rep. Boehner, at least some of us are aware that the Hastert Rule is not in the US Constitution, and you can, if you so choose, bypass the rule at any time. 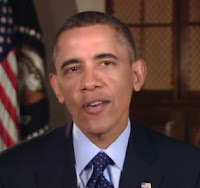 In his weekly address, President Obama tells the American people that a series of harmful budget cuts—called the sequester—have taken effect because Congress failed to act. Because Republicans in Congress refused to compromise to close tax loopholes for the wealthiest Americans, hundreds of thousands of Americans will lose their jobs or see their paycheck reduced, and middle class families will be hurt. Congress must join the President now to replace these cuts with a balanced approach that reduces our deficit while also making smart investments in areas that help our economy grow. Why do Republicans, especially Speaker of the House, John Boehner, repeat over and over that the president is not exercising leadership and does not have a plan to end the sequester? What's wrong with these people? Say you don't like the plan; say you won't bring the plan to a vote. But stop sounding so stupid by saying there is no plan, because you know damned well the president has a plan. There is no possible definition by which the Republicans can be considered an actual political party any more. They can be defined as a loose universe of inchoate hatreds, or a sprawling confederation of collected resentments, or an unwieldy conglomeration of self-negating orthodoxies, or an atonal choir of rabid complaint, or a cargo cult of quasi-religious politics and quasi-political religion, or simply the deafening abandoned YAWP of our bitter national Id. But they are not a political party because they have rendered themselves incapable of politics. With whom does President Obama negotiate if and when talks about avoiding the fiscal cliff resume? Obviously, Boehner cannot call the troops to order. Is another Republican in the House capable of doing the job? Anyway, Obama was giving away far too much in the deal, but the Republican members of the House did not have the good sense to appreciate their Christmas gift and and ended up saving the president and certain Democrats from themselves. So it's probably off the cliff or the gentle incline - take your choice. The Republicans really need to stop scaring investors, banksters, and financiers with their brinkmanship in this fragile economy. Oh, and to change the subject, Obama nominated John Kerry as Secretary of State. Kerry is an excellent choice, but he is likely to be swiftboated all over again (yawn), just as Susan Rice was swiftboated out of contention for the cabinet post, through no fault of her own. When I left for England, I fervently hoped that the matter of possible default by the US federal government would be settled by the time I returned home. While I was away, I didn't follow the news closely, but - Alas! - nothing is settled, but the US House of Representatives did pass the awful Boehner bill for cutting the deficit, which I trust (but you never know!) will go no further. Please read IT's post titled 'Destroying America' at The Friends of Jake in which she links to Paul Krugman's column on the subject of 'balance' in the news in the New York Times. What have we come to in this country? In the midst of my day with lots of other matters demanding my attention, I took the time to write to John Boehner, who is, after all, the Speaker of the House of Representatives of all the people in the US, not just of Republicans. Come on, now, we all need to share the pain of getting our fiscal house in order. The rich benefit most for the privilege of living in our country, so they should be willing to pay their fair share. Warren Buffet and Bill Gates agree. 72% of the people in the country want to see shared sacrifice, and they do not wish to see the deficit reduced only on the backs of the fast-disappearing middle class and the poor. Do your job as speaker of the House, Rep. Boehner, and represent the majority in this country. I could have said much more, but when writing to politicians, I believe brief is better. Yesterday, as I sat down in to watch a little TV, what should appear on the screen but the sight of John Boehner giving the commencement speech at Catholic University. What!!! John Boehner who, if he had his way, would cut programs that serve the poor to the bone. Why was he chosen as the commencement speaker? Then, as I watched, he took his hankie out of his pocket and wiped his nose. Oh well, his nose was running. What else could he do? No wait! He's crying - again! Boehner went on to speak tearily of difficult times in his political career and how he always prayed to do God's will, and that he prayed to the Blessed Mother when he was asked to resume leadership of the House, and she didn't exactly answer him, but Coach Grant did, and that was pretty damned close, except he didn't say "damned" in the commencement address. Does Boehner ever shed a tear at the thought of the poor whose difficult lives will be worsened if he is successful in getting his policies into law? Please! Watch the video at Mediaite. A group of prominent Catholic academics have signed a letter to Speaker of the House John Boehner, on the occasion of his forthcoming commencement address at the Catholic University of America. I will provide commentary later today, but the letter really speaks for itself, respectfully, clearly and in a way to challenge the Speaker to consider his policies. The letter will be delivered to Boehner's office personally by some of the signatories tomorrow morning. Read the entire letter at the link above. It's good, and its list of signatories is impressive.